I just got these large bamboo washcloths from ILuvBamboo. These are really large washcloths 10×10 inches. So they are really easy to hold and use. They are made of 100% bamboo fibers and they are super soft. They feel great on the skin and are also super absorbent. One of the best washcloths I have ever used. Very luxurious. They come in a set of six, each one has a green ribbon around it which I really like, I kept the ribbons and tie them on and leave them out in the guest bathroom. I think they look really nice, almost like a spa. 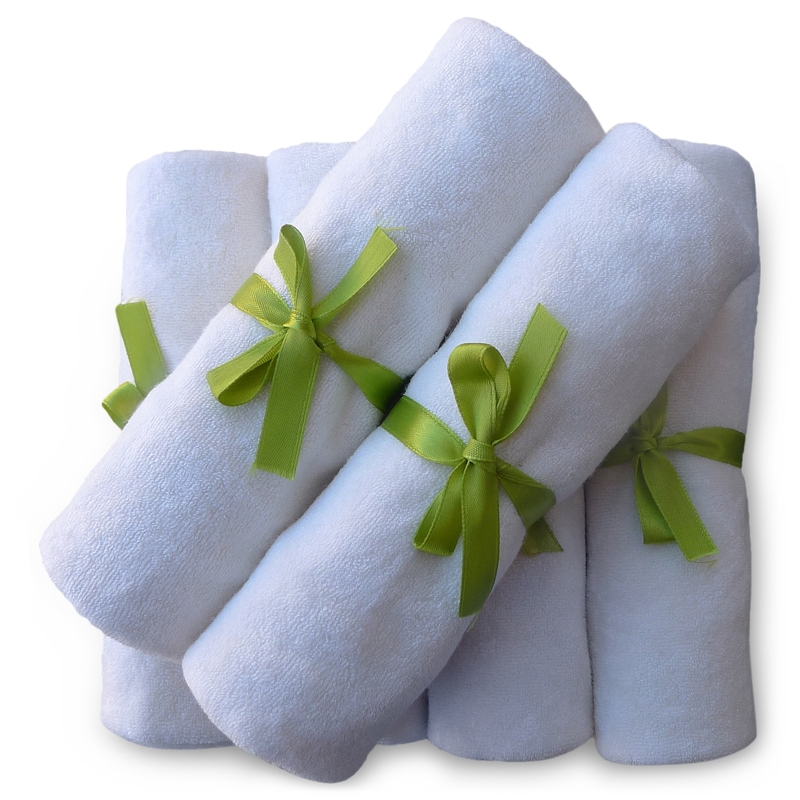 Since the are so soft and luxurious my guests can feel like they are at a spa or hotel when they are using them. Very well made and high quality materials. Hypoallergenic which is also great for my guests since everyone is different I don’t have to worry about allergies. SUITABLE FOR DELICATE, SENSITIVE OR ECZEMA SKIN IN BABIES AND ADULTS – Bamboo fiber is naturally round and smooth, hence there is no sharp spurs to irritate the skin. It is gentler than synthetic fiber. Naturally hypoallergenic, antibacterial and antimicrobial; these washcloths are an excellent partner for your skin. NO DYE is used. It is kind and gentle on your skin; thanks to the super soft, silky smooth and luxurious material used. REUSABLE AND DURABLE – Made from 100% organic bamboo fiber; it is extremely resilient and durable, hence LAST LONGER. This turns out to be a COST EFFECTIVE option that will weather the frequent washing. These washcloths are sewn in a LOCKSTITCH manner to AVOID SNAGS from occurring. MORE SOFT & ABSORBENT – Compared to cotton, bamboo is stronger and more soft & absorbent. Comes with 2-sided bamboo fibre to absorb more compared with most washcloths which are only 1-sided. EXTRA LARGE FOR EASY HANDLING – At a generous size of 10.6″ x 10.6″ (27cm x 27cm), bathing and cleaning time for babies are more CONVENIENT and easier without much fuss. Keep some in the bathroom, baby’s change table or high chair; and diaper bag so it is there when you need it. CLICK THE ADD TO CART BUTTON NOW – Buy for yourself or baby. Also a good gift for baby registry or baby shower. You have nothing to lose but all to gain by purchasing iLuvBamboo Washcloths. We are very confident in the high quality of these washcloths. If it does not meet your expectations, send it back for a full refund – 100% MONEY BACK GUARANTEE. You can purchase these washcloths on Amazon!